Singer Madeline Fuhrman in her latest music video for her song 'Fragile' wearing a gold necklace from Platt Jewelry in L.A.
Last week Madeline Fuhrman's latest music video for her song 'Fragile' debuted on LoveGold.com and it has been sweeping the internet ever since! The video was done in collaboration with LoveGold and was directed by Madeline's sister, Actress/Director Isabelle Fuhrman. The video for the song, which is one of my new favorites, is entirely black and white with the amazing gold accessories being the only color that you see. This effect makes for a truly romantic and magical experience that blends with the song perfectly. I was thrilled that I was able to be on set in L.A. at the legendary Chateau Marmont surrounded by so much talent and so much gold from Neil Lane and Platt Jewelry while the video was being filmed! Check out some of the behind the scenes photos that I was able to snap while being on set and don't forget to watch the video at the end of the post! Gorgeous vintage gold jewelry from Neil Lane and Platt Jewelry was the costar of Madeline's video giving the vintage Hollywood theme its luster. Isabelle Fuhrman surveys the gorgeous Neil Lane and Platt Jewelry to style Madeline with in each scene. It's a tough decision when there are so many amazing pieces. While the accessories are being chosen and shots are being set up, Miss Madeline and the rest of the cast get glam in style with retro hair and make up! Madeline gets assistance from her sister Isabelle with her vintage Neil Lane Necklace before she walks onto the set of 'Fragile'. Madeline gets ready to film the beginning scenes of 'Fragile' at Chateau Marmont's Bar Marmont. It was so fun seeing all of the actors transform into people from the golden days of Hollywood. It felt like we traveled back in time. I loved this vintage gold bracelet from Platt Jewelry (top) and this long vintage gold necklace from Neil Lane that Madeline is wearing (bottom). We can't forget about the dapper gentlemen in the video. These oval vintage gold cufflinks from Neil Lane capture vintage Hollywood dandies perfectly. I think my favorite pair of cufflinks on set were these vintage gold owl cufflinks from Neil Lane. You can only imagine what kind of fun loving guy would wear these to swanky Hollywood event. There were fab men's rings on set and I wanted all of them. I am a sucker for amazing gold men's rings like this one from Neil Lane. This vintage Neil Lane gold cuff went perfectly with this purse that actually belonged to the actress. Madeline gets set up for the first shot of Day 2 and we also get to meet Jesse, who played the guy who wins Madeline's heart. Fun Fact: He was also in Madeline's video for 'Something Beautiful'. Isabelle and Madeline had every little detail for the video taken care of. Even the note that the bellhop "Fred" gives Madeline involves gold! Madeline had a blast the entire shoot dripping in vintage gold from Neil Lane and Platt Jewelry. She is the perfect fit for gorgeous gold! The men in the video shower Madeline with gold. It is a hard life getting gold gifted to you all the time. 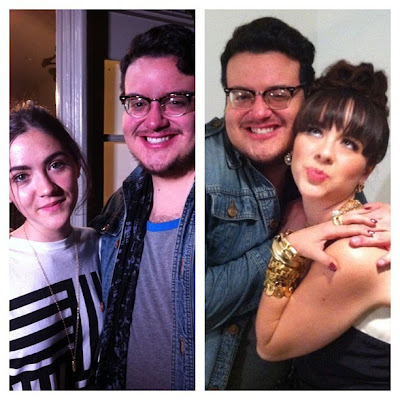 Thanks so much to LoveGold and Madeline and Isabelle Fuhrman for letting me on set of the 'Fragile' video. It was my first time seeing a music video being filmed from start to finish! For the best in gold be sure to check out LoveGold by going to Facebook.com/LoveGoldLive or by following on Twitter @LoveGoldLive.